KANGEN Water ionizers are most often used by health experts and people who are looking to reduce acidic toxic waste in the blood, tissues, and fluids of the body. Drinking water is one of the easiest and most important things to do for your body. Drinking ionized alkaline water produced by water ionizers is even better. A water ionizer is more than a water filter; it is a special type of water system that changes the structure of water to an ionized state and makes it alkaline. It is this ionized water, or alkaline water that helps to balance body pH because it is very alkaline creating many healthy benefits for users. 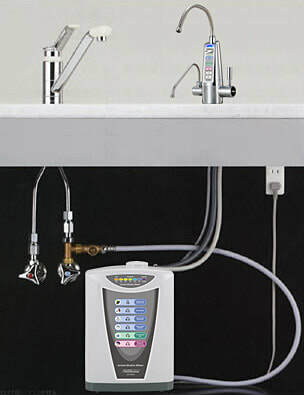 A water ionizer can be placed on your counter top, mounts to your wall or is installed under your sink. It may be connected directly to your faucet with a diverter that allows you to alternate between running water through the ionizer or running water through your faucet. PurePro NZ supplies a range of Kangen water producing ionizers to meet your lifestyle and wellness needs. Compare our water ionizer models to see which one is right for you. Better tasting water and no more buying bottled water. Alkaline water has antioxidant properties that help counteract free radicals. It helps to cleanse the organs and is particularly effective in cleansing the colon. Along with cleansing the body’s inner systems alkaline water also rejuvenates the skin and keeps it hydrated. Drinking more alkaline water is an excellent treatment for Obesity, Diabetes, Psoriasis, Arthritis and Osteoporosis. It washes acidic waste from the body. None of the 'drinking more alkaline water' and other water ionizer health benefits mentioned above should be considered a cure for cancer and other geriatric diseases. It is simply a way to strengthen your body to fight the disease more efficiently that has invaded it.